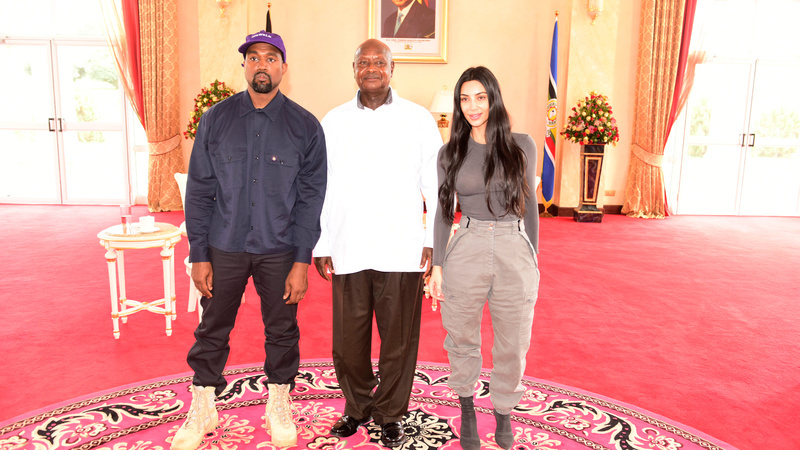 Rapper Kanye West (L) and Kim Kardashian (R) pose for a photograph with Uganda’s President Yoweri Museveni when they paid a courtesy call at State House, Entebbe, Uganda October 15, 2018. Presidential Press Unit/Handout via REUTERS ATTENTION EDITORS – THIS IMAGE WAS PROVIDED BY A THIRD PARTY. They are celebrity supernovas blazing a trail through the social media firmament, demanding our attention and sucking us into their capricious orbit. Love them or hate them, you can’t avoid them. Yoweri Museveni, the 76-year-old Ugandan president who has been in power since 1986, lives in a very different world. His power derives not from Twitter — although he does tweet, sometimes, with a fondness for homespun farming advice — but from the tanks that he commands; from the elections he has won, or rigged in his favour; from his control over the finances of an entire nation. These are real things, with real consequences, for real people. On Tuesday, when Ye (as he is now known) and Kim rocked up at State House in Kampala, these worlds collided, with excruciatingly awkward results. Museveni began by asking Kim what exactly she does for a living before awkwardly accepting Ye’s gift of a pair of Yeezy sneakers. Thoughtfully, Ye brought his own pen to sign them. And suddenly, it all makes sense. Ye has not come to visit Yoweri Museveni, the ageing, autocratic, sometimes brutal president-for-life of the very real Republic of Uganda. Despite their best efforts, their worlds are so different that they are mutually exclusive, and they have nothing to talk about. Finally, Ye gets out his pen and signs his sneakers. It is unclear what this signature is worth to Museveni, who typically appends his own signature to legislation and treaties, but he accepts the gift graciously enough. Ye and Kim may not realise it, but they gave Museveni another gift that day — by sprinkling the president with just a little bit of their celebrity stardust. That stardust will be used to support Museveni’s violent homophobia, and his crackdown on opposition leaders, and the corruption endemic to his regime. It will be used as ammunition in Museveni’s war with another rapper, Bobi Wine, who did not have the luxury of confusing Uganda and Wakanda as he was being tortured by Museveni’s soldiers.